I am making good progress on my Aiming For Accuracy Quilt Along. A new pattern is released each week, so it is important to keep up to date. My block size is getting closer to the stated one. This week, one measurement was actually a wee bit large and the other, right one. This week, was two units side by each. It really helped to lay out the finished blocks to help determine colour placement. I will need to do this each time now to ensure a good balance between the yellow-oranges and the re-oranges. Couldn't resist putting in that spider web fabric. Just one sashing strip between the two units this week. I will admit that I had to re-stitch a few seams to get better match at the intersections. Those stubborn ones I secured with one pin and the second time, they came out so much better. Even if you are like me and rarely pin a seam, don't be afraid to do it when you need. I have had this dress for years. it is made from rayon and is showing some wear. There are more than a few tiny holes where the threads have frayed. Problem is that I still love it, and it's still so bright and cheerful. What to do? I'm taking a lesson from Deanna at Wedding Dress Blue, and re-making it. Mind you, she often renovates them to 'new' clothing. I decided to go for some chenille and make a pillow. I determined the best use of the fabric, avoiding seams, was to cut 8 1/2 by 22 inch pieces. I got 5 of those. They were layered on top of a piece of black cotton. Rayon shifts around a lot, and required a fair bit of pinning. To make this type of fabric, you need to cut across the bias. Once I had the layers, I used a piece of thin soap and drew the lines. The diagonals are for sewing and the straight ones are my pivot points. Sewing done, about 1/2 inch apart and set at my normal stitch length. very carefully, cut between the rows of stitching, but not through the backing. You can make repairs is you cut through, just add a patch behind and re-stitch in the affected area. Into the washing machine with a load of towels and then to the drier. I used 5 layers of rayon and one layer of cotton backing. This makes quite the firm chenille. Add some borders and backing, and a pillow to hug. I made a pillow form from some really thick quilt batting, (I think it was a comforter batt that I was sold by accident). It is very fluffy and it was sitting in the house, so I didn't have to purchase any thing to make this project. I'm back to crochet this week. Got the first two rows complete and then weighed them to ensure I have enough yarn. No worries. I bought 5 - 400 gram balls, should be ample. Made 5 of the little squares in short order. Need to make 19 more of them. They go quite quickly and are fairly easy to do. I really do need to find my self one of those large handle crochet hooks. I find it more difficult to work with the chunky yarn than the thin ones. We're off to a friend's cottage this weekend, so don't know that I'll get much needlework done. I usually take my crochet as I'm less likely to lose pieces. The weather might not behave, cold, so perhaps, I will get much accomplished. 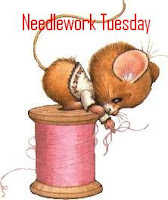 I'm curious whether you take your needlework when you go on vacation? Sarah at Lit and Laundry has Halloween on her mind. This week she finished stitching the cutest little ghost girl and last week it was lovely spider web afghan. Chenille is indeed awesome! Great use for an old garment. I've been wanting to try chenille for some time, but haven't gotten around to it. I have taken some small craft projects on vacation, but they never get done. I find it hard to visit with people and do some crafting at the same time. I can't give either my full attention. I didn't do much needlework/crafting this week, so I won't be doing a post. Have a great time at the cottage! I always take hand work with me on vacation. It's my favorite way to spend a little down time. I love your chenille. It's on my list of things to try someday. Your chenille came out great. I have that on my list of things to try "one day"
Right now, my days seem to be filled with knitting, not much sewing. Enjoy your time at the cottage. Your chenille is awesome! What a way to make use of things you love. I'm still focusing on my crocheting because at the rate our weather is going I doubt we're going to have any more summer and I'll need it. Lol. Have a good time at the cottage. I always take knitting or crocheting for something like that. Something I don't have to count or follow a pattern. I can never just sit still so I always have to have something at hand no matter where I am. That pillow is gorgeous! And what a cool keepsake of a loved dress. I have a box of baby/toddler clothes I want to remake - probably into a baby quilt, but can't get myself to cut them up.